Join us in Denver November 14-15, 2017 for an opportunity to learn about the LÄGLER® Premium Sanding Training (PST®) concept, Norton | Vermont Natural Coatings PolyWhey® Professional Wood Floor Finishes and Norton Abrasives. Join other professionals for an advanced Sand & Finish training event at the new LÄGLER North America training facility in Denver, CO. Learn from NWFA-certified experts through all phases of the process. You’ll master advanced techniques for preparing a wood floor, sanding various species, minimizing scratch patterns and bringing the floor to an optimal state for stain and finish application. Learn how to increase jobsite quality and efficiency during the LÄGLER Premium Sanding Training (PST). Tap the expertise of each company to gain valuable information on equipment use and maintenance, tips for choosing the right abrasives, and finishing techniques that yield high quality results. 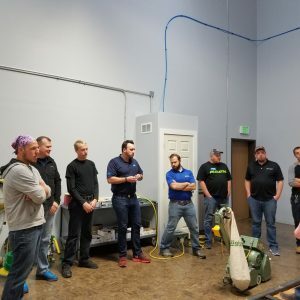 Enjoy hands-on experience with Norton Abrasive products, Norton | Vermont Natural Coatings PolyWhey Professional Wood Floor Finishes and the full line of LÄGLER professional sanding equipment. COST: Instruction: $500 per person. Lunches and one dinner (first night) provided. Receive Lagler PST Certification and two credits towards your NWFA degree. Students are responsible for their own lodging and transportation. Recieve $100 in free abrasives per company. To reserve a place please contact Audrey Fox at 802-473-3292 or ahix@vermontnaturalcoatings.com. Deadline for registration is October 31, 2017.